The core purpose behind accident analysis is to develop a better understanding of the actions, decisions & omissions that led to an accident so we can all learn & hopefully be better equipped to prevent similar accidents in the future. Over time I’ve trained with different cave organizations on different continents to get as wide a stance as possible in terms of influences and then practiced every technique I’d been taught. So it’s safe to say I’m passionate about the activity – just like any other cave diver. However as this passion has been fueled I’ve developed a way of looking at the activity that has had some unfortunate consequences. I didn’t consciously formulate these perspectives instead my experience seemed to make them an apparent truth based on what I had encountered so far. Before I begin I’d like to acknowledge that I’m just a diver and hold some shame about how my approach led me to my close call & also like to acknowledge that anyone that has influenced or trained me has no responsibility for what occurred. Ironically if I had only applied some self-reflection and considered some “what if scenarios” as per my training I could have caught this much earlier. I was sump diving with a group of experienced cavers checking leads off a dry passage. We’d returned to these leads as they had been checked many years earlier but with a different set of eyes and arguably better equipment some of these may open up in ways that were just not seen on last glance. In fact the last dive on one of these leads did open up and was subsequently pushed and explored extensively –it just went –seemingly on and on. So when I was pointed at the next lead & asked to poke my head in & see if it went I was enthusiastic & hopeful. To locate all of this activity we were about a 60 minute porterage of equipment from the cave entrance, we were diving sidemount and choosing to use 3l steels. The use of 3l steels made a lighter carrying weight, reflected the expectation that these leads if they did go would quickly go to dry chambers and the acknowledgement that this was reconnaissance for later exploration. Essentially we were crossing the leads off & were confirming they didn’t go. We were also diving solo. Sometimes we do and sometimes we work in teams. I appreciate there are well rehearsed & logical arguments on both sides and in this case due to the above expectations, the tightness of the passages and usually appalling visibility we’d opted to solo dive. I crawled upstream on my belly into the entrance pool about 30 cm deep and 1 m wide. The water, unusually, was crystal clear as I peered underwater. I could see the passage directly in front of me, golden white limestone and crystal clear water reflecting off the walls from my head torch. It looked possible. Usually these sumps are covered in a fine layer of sediment that quickly disperses into the passage and drops visibility to zero visibility so you either dive by feel or sometimes get ahead of the cloud but inevitably must always return through the turbid water. So the clean rock surface & clear water was enticing. There was no way I could continue on my belly so turned on my side preparing to keyway along the rift. It was snug. I looked forward and could see that the walls of the rift didn’t taper in but continued unevenly to what looked like larger passage & possibly an air bell about 3-5m in front of me. So I decide to continue & head for what looked like ongoing passage. The wall was hard on my back and on my chest but as I wriggled I was making progress. The water was so clear. I was in about 2m of water moving forward. The top & bottom of the rift was within arm’s reach so I had my arms extended in front on me pulling myself along –visualize a rectangular chimney on its side. I guess at some point the walls did get closer but as I was continuing forward and the whole time was spent wriggling & squirming I didn’t notice. It was just a matter of adapting my form to the shape of the passage and then I should be able to move forward. 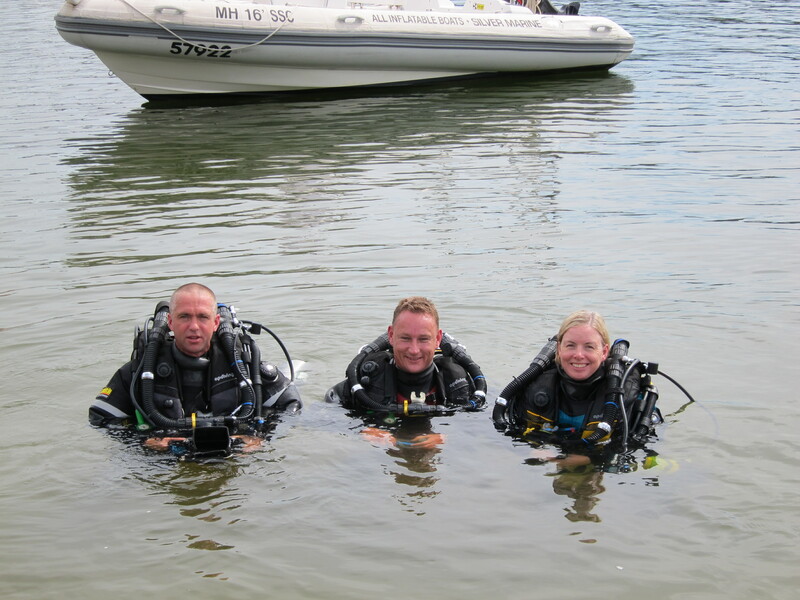 Another day, another, less stressful dive. 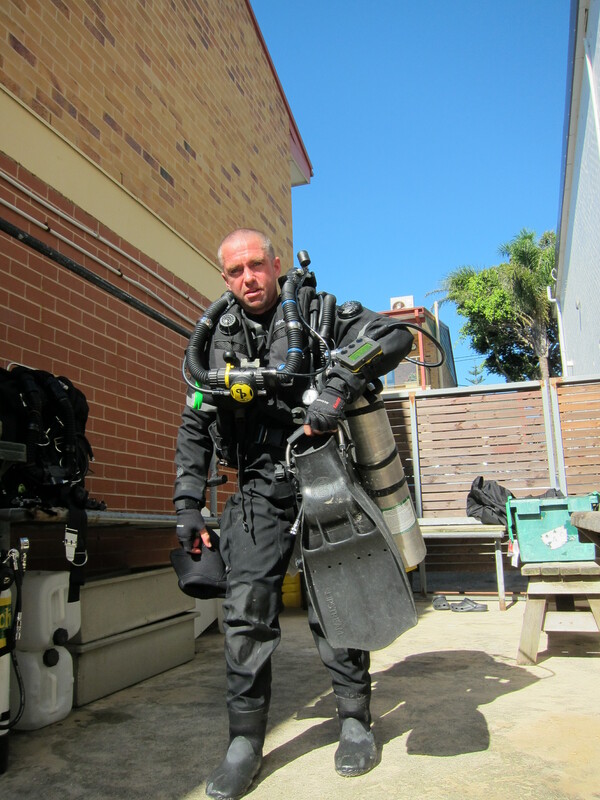 Alex heading out for some rebreather training. By now it was very tight but I was less than half a meter from the end of the squeeze. Craning my neck I could see my bubbles running up the walls into a small air bell directly in front of me. In between breathes it looked as if I could at least stand in that space and determine if the passage continued above water. Things seemed to be going right and when I surfaced I’d be able to report back whether the cave stopped or went further. That would be my turn point so we could come back at a later date. All this was passing through my mind as I continued to wriggle. And then it happened. My wing inflator button secured to my chest began to inflate as it was squeezed between my chest & the rock. Suddenly all forward movement stopped as the wing pinned my chest forward against the wall and at the same time pinned my back. I was stuck. At first I tried to wriggle but my torso was immovable. So I stopped to try and work out if I could back up. As I tried it dawned on me that as I hadn’t moved the inflator was firmly pressed on and inflating. The dump valve was open and the air was going in and blowing out behind me and as such my 3l cylinder was draining. And draining quickly. To reassure myself I reached my hands back to the second stage round my neck but due to my position in the passage with my arms extended I couldn’t reach it. So now I had 1 available cylinder of air that was rapidly draining into the water around me. As I couldn’t reach the second regulator I tried to jam my hand down under my other arm the hope of reaching the inflator. All I hit was elbow & rock. I rammed the hand in slicing it on the wall. At this point I realised that what a moment ago was an exciting challenge was now the last bad decision I’d ever make. I knew if I didn’t get moving I was going to quickly run out of air, then drown. Drown in shallow clear water surrounded by ancient unforgiving & immovable rock. 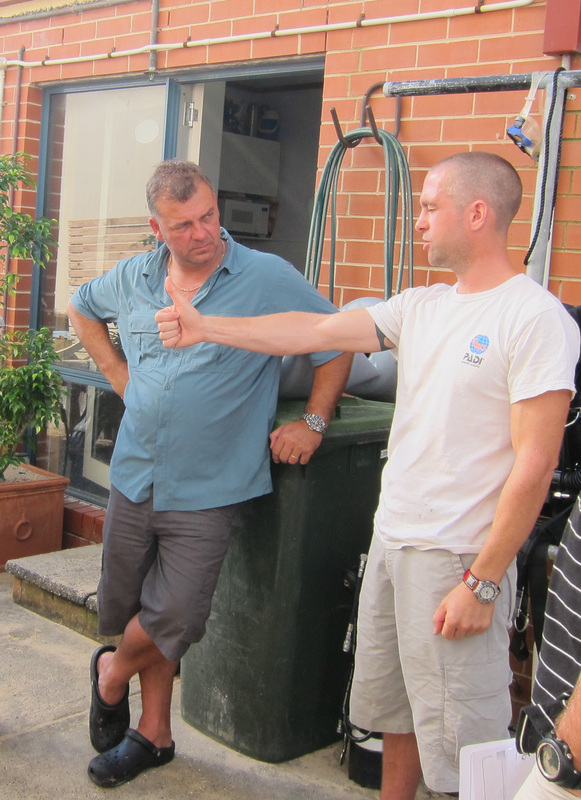 Sometimes ending the dive is not as easy as others….